I’ve always had a particular fondness for Dunhill, ever since I visited the leather workshops in Walthamstow years ago for my book ‘Best of British’. They’ve also made several of my most lovely things, such as my vintage box, canvas doctor’s bag and alligator glasses case. I was pleased, therefore, to see that the collections seem to be settling in a good place. This has been the direction for a while, but the range has got a little more interesting under new creative director Mark Weston (and crucially these days, with support from a new CEO). Dunhill always had a smattering of nice knitwear, outerwear and leather accessories. But the offering was never that broad, or consistent over the years. Now, it seems, there is something for everyone – from the conservative to the experimental. Take an example. 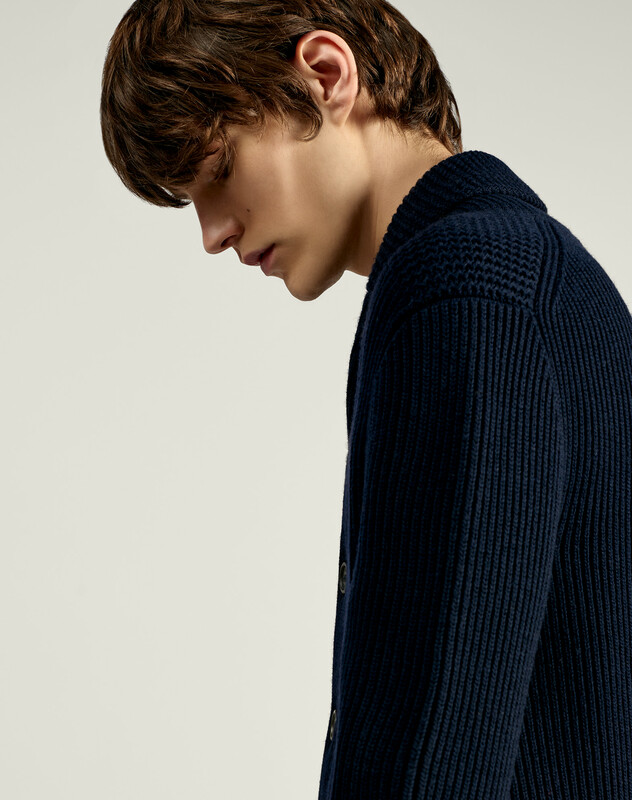 The knitwear this season includes three navy pieces that span this range. First is a cotton crewneck sweatshirt (above) that I featured in 2017 as one of my favourite pieces of the season, and is still available. It is in a beautiful summer-weight cotton, with deep ribbed cuffs and hem. 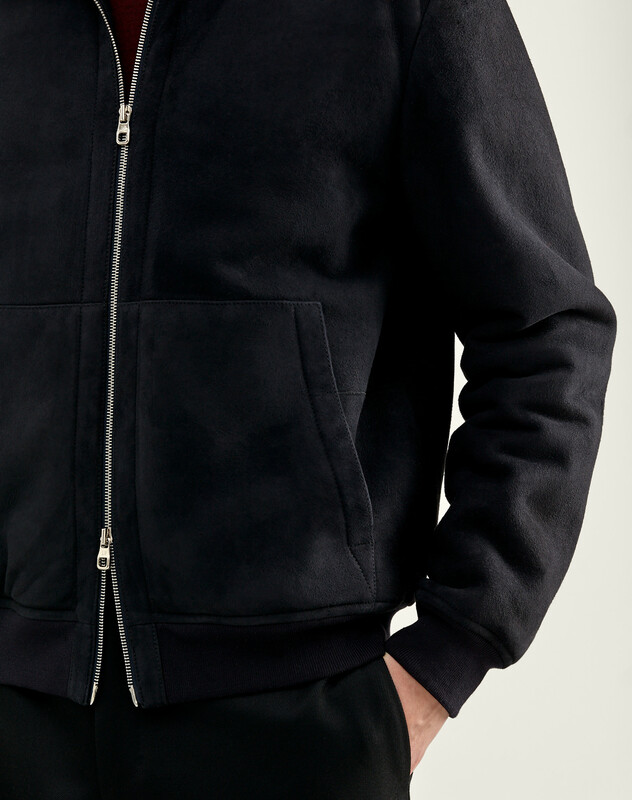 A really elevated version of the sweatshirt - but so subtle that it’s likely to go unnoticed by all but the wearer. Second is something more unusual. A shawl-collar cardigan in a deep rib (below), with horn buttons (rather than the normal leather footballs) and slimmer, more jacket-like cut. Again, nothing extraordinary - but there are some interesting, deliberate and modern design choices there that make it stand out. And third, a piece that verges on fashion. 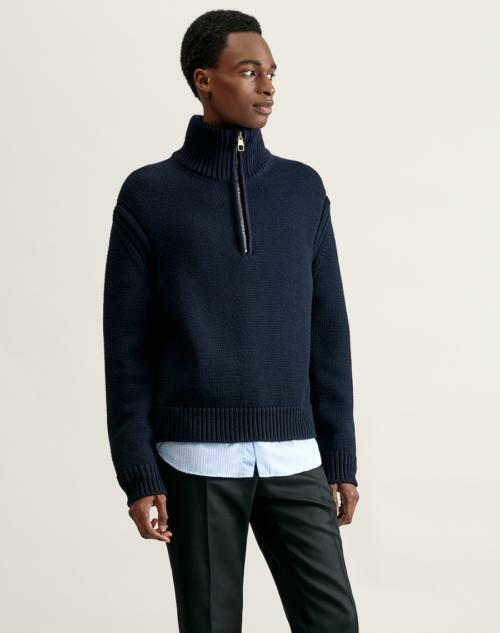 A half-zip sweater with a drop shoulder and oversized neck and zipper (below). The pictures don’t necessarily show these aspects of the garments very well, but that neck is significantly and noticeably bigger than a regular knit. On me it pushes up at the chin. And the zip is wide, with a large puller in a mix of brass and silver. I’m not sure whether I like it. When undone, it flops down around the shoulders; but it looks great under a coat. Either way, I find it interesting. It’s not a fashion piece with a message scrawled across it, but it’s definitely stylized. 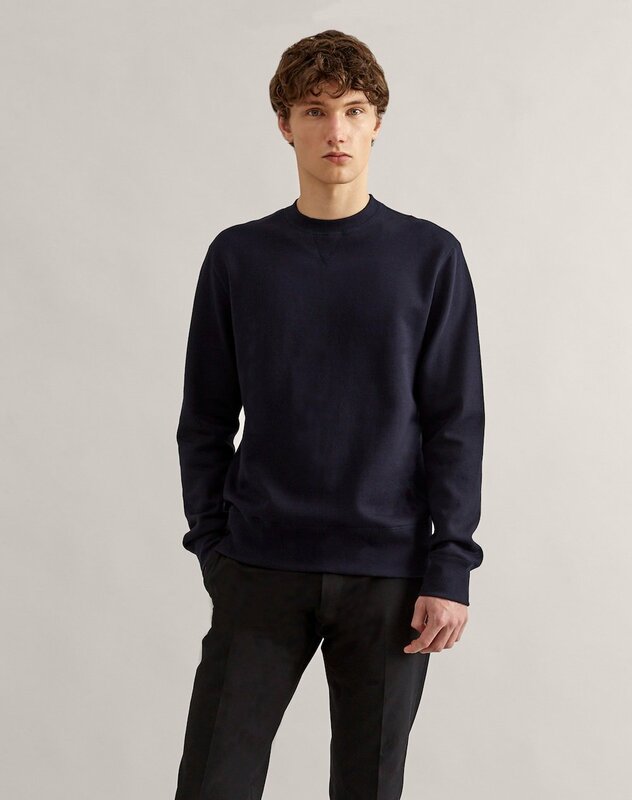 And it’s very well made – in a luxurious chunky merino. This last category is reminiscent of the Classic Collection at Connolly: simple colours, great materials and top makers, but more experimental designs. There are similar ranges elsewhere. 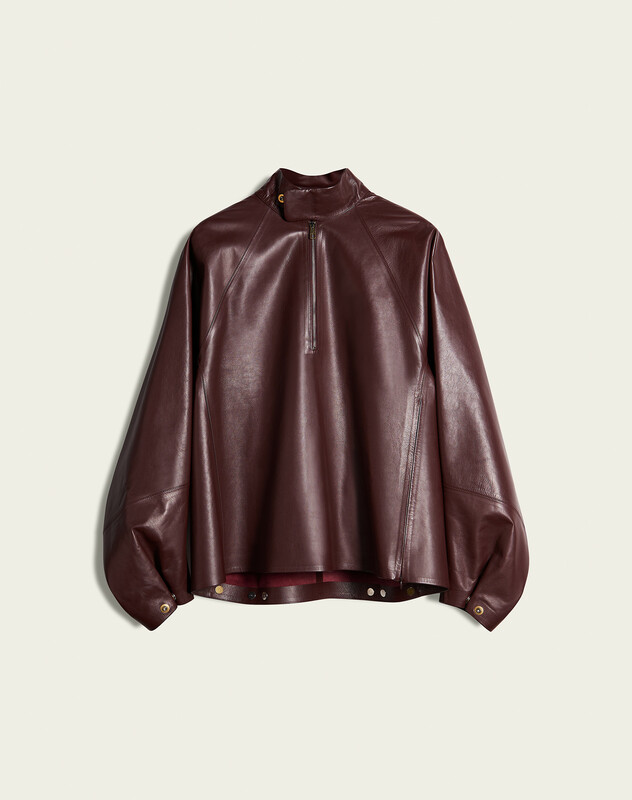 The leather outerwear at Dunhill is always top-notch as regards quality, but there is also a range of pieces now. 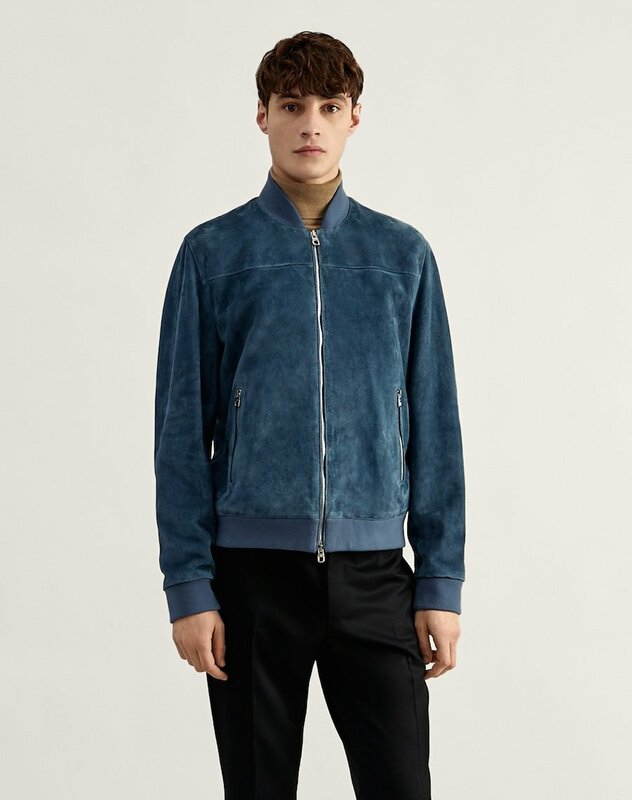 There are navy suede and shearling bomber jackets, for example, which are just simply conceived and thoughtfully executed. 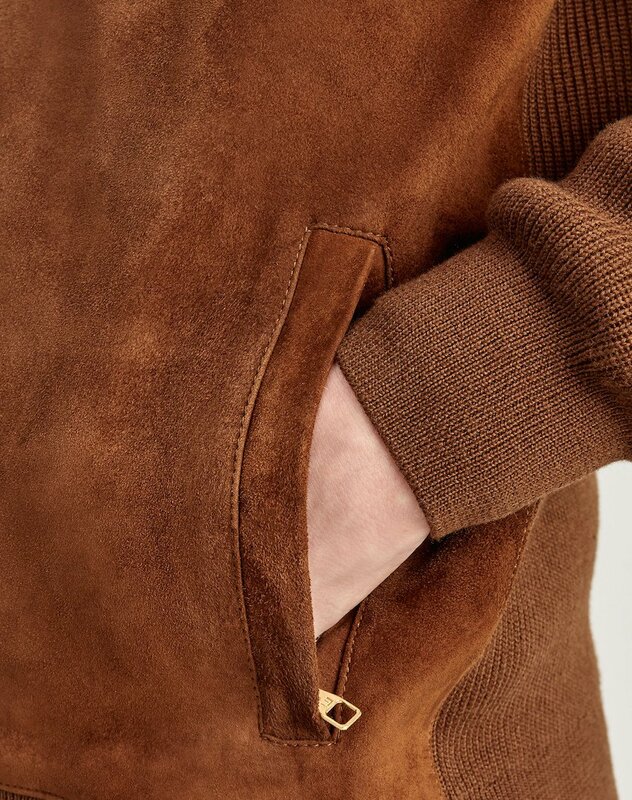 The shearling ‘track jacket’ (below) is interesting for making lamb shearling look like a piece of sportswear, but it’s a question of texture more than anything else. Then there are more striking pieces, like a deep-red horsehide jacket or (in the summer collection) a pale-pink suede western jacket. Some of these I would wear, some I wouldn’t. And then there are crazy catwalk pieces. In the Bourdon House store I tried on a ‘racing smock’ in burgundy leather - basically a square shape with a funnel neck and a zip running up one side. I would never wear it. But part of me wishes I was the kind of person that would. The leather was stunning. This range of design is more unusual than you might think. I find brands like Zegna tend to have very safe pieces, and then wacky ones under Couture, but nothing in between. And brands like Berluti or Hermes have a lot of these in-between pieces - but they are small collections and very seasonal, so there are no staples you can reliably get from one season to the next. Dunhill seems to be doing all of this. 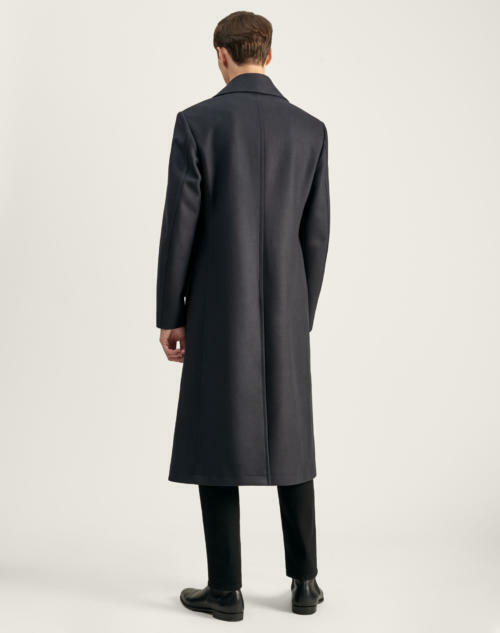 And while it’s certainly expensive, the quality is peerless and yet below the prices of Zegna, Cucinelli or Tom Ford. I know some readers will find it hard to understand coverage of these brands alongside the small, artisanal manufacturers we more regularly feature. But I do think that not being interested in them is not to be excited by good design in general. Even if you don’t want to spend a greater proportion of your money on design, you might well find the ideas interesting. Certainly the people behind our smaller brands do – from Drake’s to Saman Amel. You can follow the discussion on Dunhill leather and knitwear: Taste, style and fashion by entering your email address in the box below. You will then receive an email every time a new comment is added. These will also contain a link to a page where you can stop the alerts, and remove all of your related data from the site. I genuinely appreciate coverage of the larger, more prominent houses, as well as the smaller ones. A number of these (Dunhill and Berluti come to mind), have also made forays into bespoke tailoring recently, though I am not sure to what extent this has been succesful, or how the quality compares to the Parisian tailors or those on the row. Yes that’s the new trend, didn’t you know? It’s like the fisherman’s sweater, but more edgy. Were you in any way compensated by Dunhill for writing this? This strikes me as more of a “fluff piece” than what I usually expect from PS. Frankly, I wouldn’t be seen stiff in this stuff. Time was they had a real image and quality to go with it. Now I think their stuff is aimed squarely at a another market entirely. I’ve always liked Dunhill as well. Any thoughts on comparisons to Valstar in terms of quality,workmanship, and design? Both companies appear to provide excellent quality and value compared their more expensive competitors. Thank you. 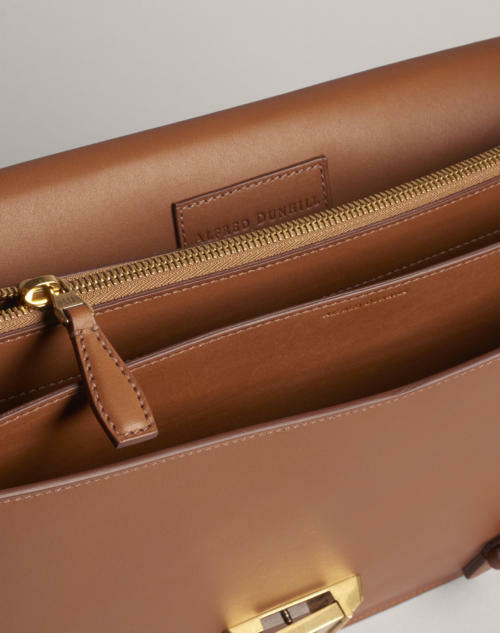 I notice that Dunhill makes some really beautiful travel bags as well. No, surely not. Valstar are still making clothes for men ! Can you please give some examples of the top makers you are referrring to? Can you please give some examples of Scottish knitwear factories? I already know Johnstons and Joshua Ellis. Appreciate coverage of good ready to wear alongside the usual bespoke and made to measure. Thanks. Hello Simon, just checking out your menu section (very good). Can I suggest something; you have a section for artisans and another for brands (with a bit of crossover). It would be good to see some levels of differentiation between the offerings so that full bespoke, budget bespoke (W&S), designer MTM (Saman Amel) and RTW had some lines between them. This would aid readers new to the site who had not read the archive and needed a quick reference, particularly if they are researching for a purchase. The benefit is in easily finding the appropriate offering according to budget and style. I bought the pink suede jacket this summer. Beautifully made and looks great with jeans. Like many of the “brands” that had a heritage (automotive, tobacco, leather in this case), the creep associated with the global consolidation under big business, Dunhill has gone all over the place. £250 for a T-shirt with their name on it. I have shirts older than those models…. It’s something we could look at, but bear in mind that this would be a very hard list to maintain. Brands change styles almost every year, and manufacturers every few years. It’s one of the reasons bespoke is so attractive. Plenty of very good MTM options out there at way below the Drakes price. And you get something that fits you! Forget all the puff about hand stitching etc. It wont make any real life difference to what you carry on your back. Too simplistic a statement to be helpful really. Drake’s doesn’t have much hand stitching, but what’s there is functional, such as around the collar. Sorry to have to disagree, but fit has to come before style. What is the point of a stylish jacket that’s too short or which doesn’t stay up on your neck? A soft shoulder with a bit of drape is bread and butter for good MTM outfits these days. Although I wish it weren’t the case, a guy can look good in a jacket that doesn’t fit that well. He can wear it open, or be a tiny bit short, and he will still look good. Fit is far more important than most people think it is, and I’ve spend a long time arguing that guys should pay more attention to it. But I’ve also learnt over the past 11 years of writing about it that style is still the most important thing. I’ve had great experience with Steed MTM, where Edwin uses his bespoke skills to manipulate patterns to suit the client. So you get both fit and the precise style you’re looking for. Am wearing one of his jackets today, and can heartily recommend. You should review his work. I guess the last comment was asking for a list to understand where to look for differentiated offerings. I understand your diffidence – I believe that objections could be overcome however – but please understand the archive is now very deep and perhaps needs more enquiry structure? Perhaps it is something that advertisers could fund/support? The net now seems to offer a lot of data but little detail – hence the value in PS. It’s one point we created the Guides recently – there are now six in there, and more coming. Plus there is the ‘Rules’ and Lookbook under the Style section. Do let me know if you have any other suggestions for groupings from the archive. 1. It sits, as a menu type, within PS. 2. Acts as a short, simple, differentiated guide similar to other PS guides. 3. Has active links (i.e. via reader choice opens through to other’s commercial sites in a separate tab), allowing more detailed browsing (example – for cost- focussed bespoke it might lead to W & S). 4. Is not a PS commercial portal in that it does not host transactions. 5. Assists PS in ad revenue through discreet, well managed links (a world away from the awful pop-up mechanism). 6. Especially useful for those entering into the world of bespoke or quality style purchases. Time to get an intern in exchange for some hand me downs! It’s the advertising that me off. Entire ad campaigns for an increasing number of brands now feature wall-to-wall anaemic proto-catamite youths with perfect physiques. How on earth are we ageing, wrinkled, grizzle-haired blokes with impefect bodies supposed to relate to this marketing flavour? Even if we lay aside the models, the styling is only really suitable for the under-25 hip ‘n cool bracket (i.e. everything I’m not). And another thing. Why do all the models have to look so glum? Women go on about body acceptance. It’s time the fashion (and sartorial) industry embraced male body acceptance too, and gave us real men modelling real clothes. Erm…point 5 re. links – you have a click-through ad from Scabal on your cloth guide (the inspiration for the comment…), what is the difference between Scabal and another guide that has a clear click-through message to other sponsors? Just wondering. I hope that right-hand section with Scabal is clearly an ad, given that is the space our ads always go. If you think the language could be clearer, do let me know. Understand. Your neutrality is without question but the Scabal element could be clearer. In its inception it was – over time less so. Re. buried links generally agree but we are a long way into the internet now and most readers know that a buried (in the text) link is a form of revenue product. For a reader they can be useful if excited by a product. PS sets a different standard though – a form of journalism or critique in the true sense (objective, balanced, fair) – agree that buried links would therefore not be appropriate. Scabal type ads/click- through however are tasteful and wholly acceptable, moreover they take you to a brand site rather than single product (as with the Rake).